Get ready, earnings season is officially here. I'm Jessica Menton, catching you up on the premarket action as we head into the final trading day of the week. JPMorgan and Wells Fargo headline today's earnings. Investors are sorting through recently released results from JPMorgan and awaiting them from Wells Fargo for further insight into the health of the U.S. economy after dozens of companies lowered their profit forecasts for the first quarter. Stocks are on pace to snap a two-week winning streak. The S&P 500 is mildly lower for the week while the Dow is down 1.1%. Trading activity has slowed recently. Plus, more bond investors are turning to electronic trading. Our Matt Wirz explains why the emergence of alternative trading venues may help investors get better trade pricing during future market shocks. Global stocks got a boost from stronger China trade data Friday, while U.S. markets were poised to open higher. Almost one-quarter of all investment-grade corporate bond trades in December were on MarketAxess, the highest monthly market share ever for the digital trading venue. Market share for Trumid Financial, a much smaller electronic corporate bond-trading venue, was also above average in December, a spokeswoman for the company said. The surge is the latest good news for electronic-trading platforms, which have long touted themselves as oases in the liquidity-parched bond markets but have generally lacked enough users to deliver meaningful trading opportunities. Corporate-bond liquidity—a hard-to-measure but widely discussed impression of how easily securities can be traded—is perceived to have dwindled over the past decade even as debt outstanding jumped 67% to $9 trillion, according to data from the Securities Industry and Financial Markets Association trade group. The mismatch has stoked fears that the investors who purchased new debt, especially in mutual funds owned by individuals, would be unable to sell in periods of market turmoil. The most recent such market air pocket hit in December, a particularly challenging month for liquidity because of the year-end risk trimming perennially conducted by banks. Overall, trading of corporate bonds in December dropped by about 25% from November while activity on MarketAxess only dipped about 5%. The platform’s share of overall trading jumped to new highs of 22.4% in investment-grade debt and 12.4% in junk bonds, according to data from MarketAxess. While the firm’s cut of the market typically rises in December, overall trading on the platform fell less last year than in 2016 or 2017, fueling the record market shares. To be sure, trades on electronic platforms are generally small, with Wall Street firms controlling more lucrative block trades. Most fund managers still call dealers directly to buy and sell quantities of bonds exceeding $5 million, which account for about 40% of all trades, according to data from Greenwich Associates. 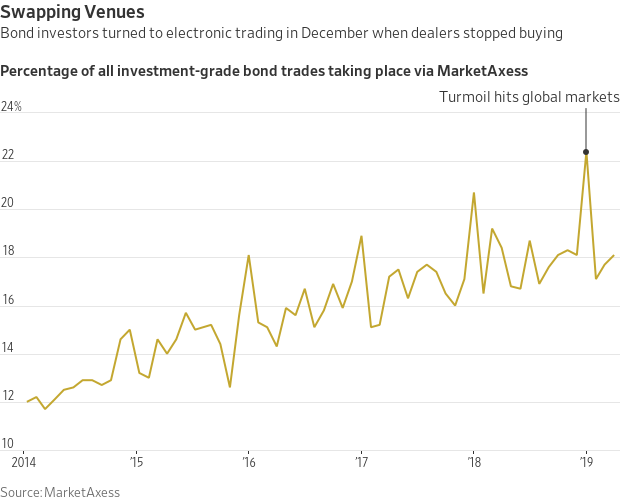 Electronic marketplaces may also be claiming more market share at year end because of the growing role of algorithmic traders and exchange-traded fund specialists in the corporate bond market, said a trader at a large bond dealer. Hedge funds gained an average of 0.9% in March, the third consecutive month of positive returns after a five-month stretch of aggregate declines, according to data provider eVestment. Those funds averaged a gain of 5.4% in the first quarter, the industry’s best quarterly returns since 2012. S&P Global Ratings downgraded 173 corporate issuers and upgraded 67 globally in the first quarter, the highest ratio of downgrades to overall ratings actions since 2016. On this day in 1996, Yahoo launched its IPO on the Nasdaq Composite, selling 2.6 million shares at an initial price of $13 a share. In one of Wall Street's wildest feeding frenzies, mutual funds and other big investors "flipped" the shares over and over until the first day's trading volume hit 204.36 million shares, meaning that each share changed hands more than 78 times that day. The stock finished the day with a 34% gain. U.S. import prices for March, due at 8:30 a.m. ET, are expected to rise 0.5% from a month earlier. The University of Michigan consumer-sentiment index for April is expected to slip to 98.0 from 98.4 at the end of the prior month. The index is released at 10 a.m. The Bank of England’s Mark Carney, Bank of Russia’s Elvira Nabiullina and Bank Negara Malaysia’s Nor Shamsiah Mohd Yunus speak on managing capital flows at World Bank/International Monetary Fund meetings at 12:30 p.m. The Baker-Hughes rig count is out at 1 p.m.
President Trump delivers remarks on 5G deployment at 2:25 p.m. The White House plans to ramp up the government’s role in speeding next-generation technologies, a key area of competition with China. The Bank of Japan’s Haruhiko Kuroda speaks in Washington, D.C., at 4:00 p.m. Frustrated by the technology industry, small banks are starting to rebel. 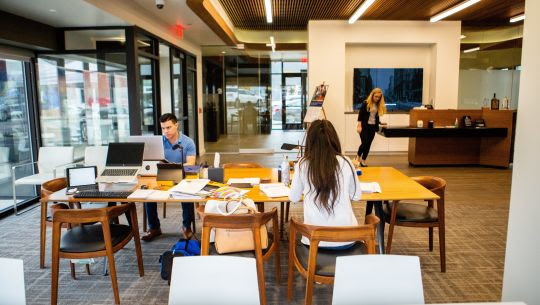 Small lenders are struggling to keep up with big banks’ flashy tech offerings, so they turn to service providers for help. But many are pushing back against what they view as onerous contracts and mediocre digital offerings. Chevron will buy Anadarko Petroleum in a $33 Billion cash-and-stock deal. The multinational energy company will buy all of Anadarko’s shares outstanding for $65 a piece, a 39% premium to its closing price on Thursday. Uber’s IPO filing shows growth leveling off. Uber made its IPO papers public, revealing some of the secrets of a company with big, global ambitions that faces slowing growth in its core ride-hailing business. The Rockefeller Foundation wants to manage investors’ money. One of the richest and oldest foundations in the U.S. has created a unit that will raise funds from investors and place it in companies or products it determines are benefiting society at large. Vanguard is taking a tougher stance against overextended board members. The world’s second-largest asset manager plans to vote, in most cases, against corporate executives running for two or more public-company board seats beyond where they are employed. Six tax opportunities, and headaches, for retirees. For retirees, the tax overhaul of 2017 created new opportunities to cut taxes, along with some potential headaches. Here are six important changes retirees should be aware of and steps they can take to reduce their future tax bills. Citigroup President Jamie Forese is retiring. His retirement is the culmination of a series of changes under Chief Executive Michael Corbat, who has shuffled the bank’s leadership as part of an effort to refocus on growth after spending years mopping up from the crisis. The White House is seeking to blunt the use of informal agency actions. The Trump administration has opened the door for Congress to more easily overturn financial rules issued as guidance rather than in a formal rule-making process, a win for an industry that has complained the practice can be unfair. Boeing: Chief Executive Dennis Muilenburg said late Thursday that software changes will make the flight-control system on the 737 MAX “even safer” following two fatal crashes involving the aircraft. Mosaic: The fertilizer company said it will halt its mining operations in Brazil to comply with new regulations governing mining and dams. PagerDuty: Shares of the cloud-computing company surged 59% in their market debut Thursday, with the stock closing at $38.25 after pricing its initial public offering at $24 a share.